Home / Agents of SHIELD / Marvel / Reviews / TV / [Review] - Agents Of SHIELD, Season 1 Episode 2, "0–8–4"
[Review] - Agents Of SHIELD, Season 1 Episode 2, "0–8–4"
It occurred to me as I was watching this second episode of Marvel's Grand Experiment, that through accident or intention, Joss Whedon has recreated Firefly in miniature with his new series. A ragtag group of mercenaries (six, rather than nine) spend most of their time on a flying craft (complete with barn door) which the group leader has an emotional attachment to. None of them really trust each other, and everyone has their own agenda. Problem is, unlike Firefly, whose characters were immediately engaging, SHIELD is into it's second week, and I'm still not sold on the team. In fact, the only characters I've developed any sort of attachment for are Coulson (admittedly preexisting) and Skye, who is the only character with any dialogue that doesn't seem to have been taken from a bad action movie. She speaks in the way we're accustomed to a Whedon character talking, but next to the stilted military directions and meaningless technobabble of everyone else, she also comes off being the only one sounding human. 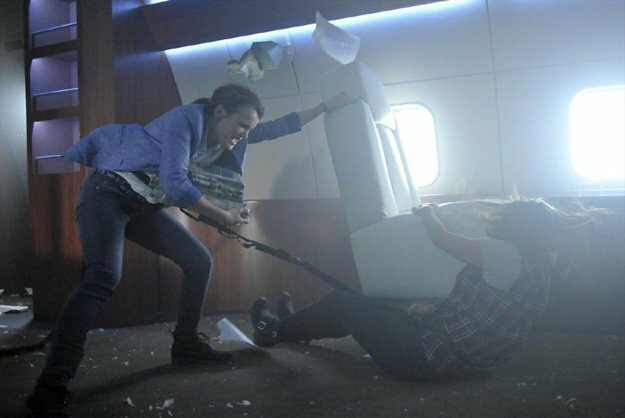 Which, I suspect, is the reason Coulson wants her on the plane. Hit the jump for the review, which contains spoilers that will be expected to do pretty much the opposite of everything they believe in. I have a axiom, that I have cultivated over years of watching TV, and very little else. It is this: the second episode of a new series will always be terrible. This is, I should clarify, exclusive to network programming and has been fairly constant across the decades. And it's all to do with the pilot system. Just as last week I said you can't tell the quality of a show based on it's first episode, because those pilots were made to sell the series' basic premise to the network. The second episodes are always clunkers, because there was a time when pilots wouldn't necessarily see the light of day. Second episodes often reiterate the same information as the pilots, reintroduce characters, and are "played safe," because in principle it is the first time the audience is seeing them. Problem is, because of the cost of reshooting a pilot, the pilots become premiers, and the second episodes just sit there, being overly repetitive and usually dull. And all of that is true of 0-8-4. Suddenly, we see very clearly the biggest problem facing SHIELD. The balance it must strike between being it's own thing, and co-existing with the cinematic efforts of Marvel. We knew it would be a challenge going in, but now I'm concerned. Because for the second week in a row, the team faced a Gamma powered threat. And it cannot exist on known threats alone. If each week they encounter a new threat based off of one of the established Avengers, the show will degenerate into little more than fan fiction, and this series can be so much more. The preview for next week looks promising, as it suggests an original threat that makes sense in universe, and that is the sort of stories that they should strive for. Connections must be made to affirm that the series has credibility when compared to the heroes on the big screen, but I would prefer they take a softer touch with it. In this episode, we got references to Stark, the Tesseract, Hydra, several to the invasion of New York, and a cameo by Samuel L. Jackson. Some worked, some didn't. They weren't as obvious and overbearing as the ones in the premiere, and could stand to be toned down a bit more. But at least they made sense in context (references to the Chitauri event used in the same way as real world references to 9/11), and in regards to Hydra, provide a sense of history and depth. It is important world building, and considering that the shared universe is such an integral part of what makes Marvel comics great, it should be a primary concern within the series. And then there is the cameo from Director Fury. And I liked it, for a couple reasons. One, the show needs a stronger, ongoing connection to the larger world, which is why it is paramount that once she gets down meeting the mother on CBS, that Cobie Smulders needs to get put on the cast full time. Coulson needs a superior to report to, to chew him out for his failures, as Fury did here. The team needs a connection to those back home, and someone in their corner when things go bad. What sold Fury's appearance here more than anything was that it wasn't the focus of the episode. It wasn't a stunt, and the plot didn't hinge on it (like Richard Dean Anderson's appearance in the later years of SG-1). The in-and-out-edness of the appearance sells it's innocence, it's everydayness. This isn't something special for the characters, so it's not something special for the show. And while any potential appearances of any of the Avengers might call for more pomp and circumstance, I think that the show is better to down play such appearances as "just another day at the office" sorts of events, rather than sweeps bait (which, easy money says someone big pops their head in come May). I liked the idea behind the premise of the episode, essentially what if Thor had been told from Coulson's perspective. The previous 0-8-4 having been Thor's hammer, the team is called in to investigate an object of unknown origin and potential hazard. It's exactly the sort of thing that SHIELD does, and that we were expecting from the series. As a basic plot framework goes, it is solid. In execution though, it fell a little flat. Part of that had to do with the cheapness of the Peruvian location. The series looks solid on sets of "the Bus," but when they ventured into the studio jungle and CGI outdoors, the whole thing started to look like an old episode of Xena. The episode, by showrunners Jed Whedon and Maurissa Tancharoen, and former Angel showrunner Jeffery Bell, is a standard issue plot: good guys meet up with folks from the past, they all go off together in smiles, old friends betray good guys, good guys begrudgingly defeat old friends. And while filling out Coulson's past is nice and necessary (especially if they intend on later revealing he came back wrong, as we got another reference to Tahiti being a "magical place"), this wasn't a particularly original way to do that. It afforded the team an opportunity to have to work together, and start establishing a bond, but couldn't there have been a more interesting way of telling that story? There is no need for SHIELD to play safe. In much the same way that it's pickup was a certainty from a financial point of view, it's success is predicated on it's association with Avengers. Viewers will turn in, allowing the writers a freedom to create unique and provoking stories. By making it simple and by-the-book, they risk alienating those viewers looking for something special. My hope is that they are running on idle to attract as many new viewers as possible, and after the first half dozen episodes, once they've got a locked viewership, really give them something special. Otherwise, I don't care if it's part of the MCU, and I don't care if it's Coulson, if it's banal, I'm going to bale. As an aside, I loved that they shot the artifact into the sun to destroy it. That is such a comic book thing to do.